When you invest in a concrete floor for your business, it’s because you need something that will stand up to tough working conditions. Over time, staining, cracking, and disfiguration can occur, especially when your floor is exposed to a range of chemicals. Even worse, the cracks and crevices that develop can cause problems with chemical containment. At Liquid Floors, we understand your business’s dilemma. Our epoxy flooring provides a great solution to chemical containment issues, helping your manufacturing flooring pass the test of time while maintaining your floor’s appearance. Epoxy floor coatings are the number one choice for industrial flooring applications because they provide outstanding impact and wear resistance while remaining easy to clean. 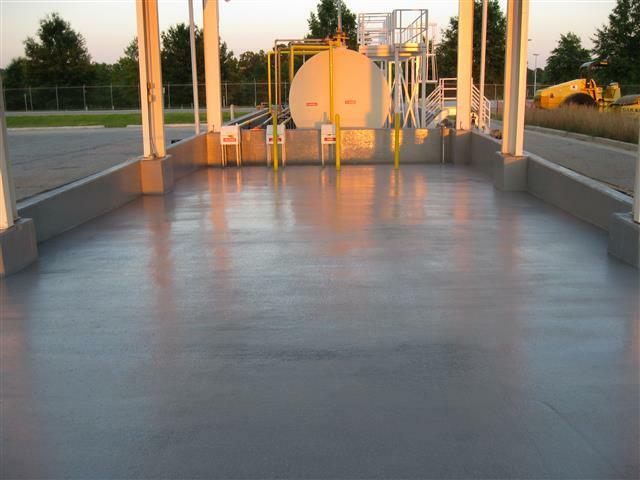 Concrete floor coatings are a resin-based layer of epoxy or polyurethane. The coating creates an impenetrable floor coating or top layer on your concrete industrial floor. In turn, this prevents the unintended transmission of water and chemical contaminants while keeping your flooring safe and durable. At the same time, it also makes cleanup of spills and meeting regulations much easier and faster, helping keep your facility operational with shorter shut-downs. Easy to Clean—Creates a barrier, making cleaning fast and easy. Wear and Tear Protection—Coated concrete lasts much longer than uncoated concrete without the need for costly repairs. Reflect Light—Concrete coated flooring reflects significantly more light than bare concrete, raising visibility and safety while reducing auxiliary lighting requirements. With over 40 years of combined experience, our team can help find the best solution for your project, whether it’s concrete polishing or protective coatings. See what sets Liquid Floors apart from the competition today by contacting us for a free consultation.